In what has been a year of frequent cyber-attacks, AntiSec, the group resulting from the combination of Anonymous and LulzSec, has released 10 GB worth of data belonging to law enforcement agencies across the United States. This attack allegedly came as a response to the arrest of Jake Davis, the alleged former head of LulzSec, the group responsible for attacking the technology infrastructure of many prominent organizations such as Sony and the United States Senate. This 10-gigabyte dump contains all kinds of confidential information belonging to law enforcement personnel from 50 police departments all across the United States, including passwords, email addresses, home addresses, credit card credentials and even social security numbers. This sensitive information is now in the wild for everyone to see, including criminals who could use it to cause great damage to the officers who have been exploited. We lol’d as we watched the news reports come in, quoting various Sheriffs who denied that they were ever hacked, that any personal information was stolen ,that they did not store snitch info on their servers. Many lulz have been had as we taunted the sheriffs by responding to their denials by tweeting teasers exposing their SSNs, passwords, addresses, and private emails. The same statement also includes details of the attack, which, for security reasons, we won’t link to here. The cyber world has suffered from a disturbing numbers of unauthorized attacks, many of them causing dangerously sensitive information to be leaked in the wild. Just last month, the same group has defiantly managed to obtain confidential data belonging to the FBI through one of its contractors, just before leaking it onto the web, and earlier this year LulzSec was responsible for PlayStation Network’s nearly uninterrupted 1-month downtime, setting Sony back over $100 million. AntiSec, which stands for "Anti-Security", is a new movement formed by members of both Anonymous and the recently-dissolved Lulz Security. 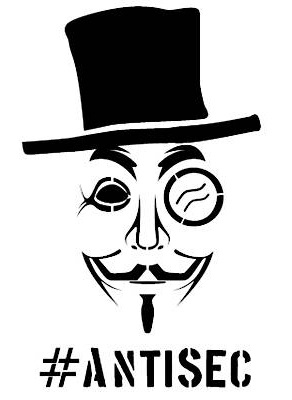 The new group combines Anonymous’ political activism with Lulz Security’s hacking skills, creating an almost infallible organization capable of hacking any organization it deems harmful. According to AntiSec, attacks are conducted to enforce transparency and accountability among governments and large corporations, yet those targeted have a very different opinion of the group’s intentions.